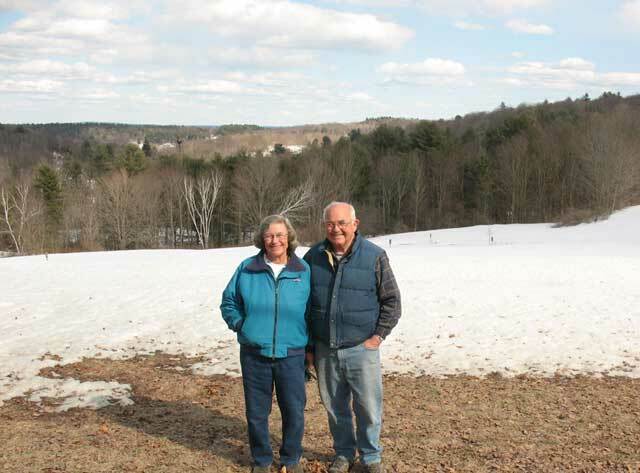 Ann and Tony Borton's love of their 114-acre property in Conway, Massachusetts and their desire to see the rural character of Conway maintained has led them to actively seek out ways to preserve the ecological integrity of their property in their lifetime and for future generations. In November 2007 they completed arrangements to donate a Conservation Restriction (CR) on 106 acres to the Franklin Land Trust and the Town of Conway. Both Ann and Tony developed a life-long love of the outdoors as children. They both grew up in central New Jersey, an area that was largely rural at the time. Tony lived on a 100-acre farm. Ann’s childhood home wasn’t as rural, but she did have room for a horse. When they came to Massachusetts in the early 1960s, they fell in love with the rural hilltowns and decided to settle in Conway. This beautiful property likely began as a subsistence farm in the 1700s. The current home was built in 1789. The previous owner purchased the land at the beginning of the Great Depression. They used the land for a dairy farm, but also grew apples and had a small farm on which they grew produce for their own use and to sell locally. The Bortons purchased the land in 1964 when Tony was hired as a professor at the University of Massachusetts, Amherst. Ann and Tony wanted a piece of land where they could raise horses. 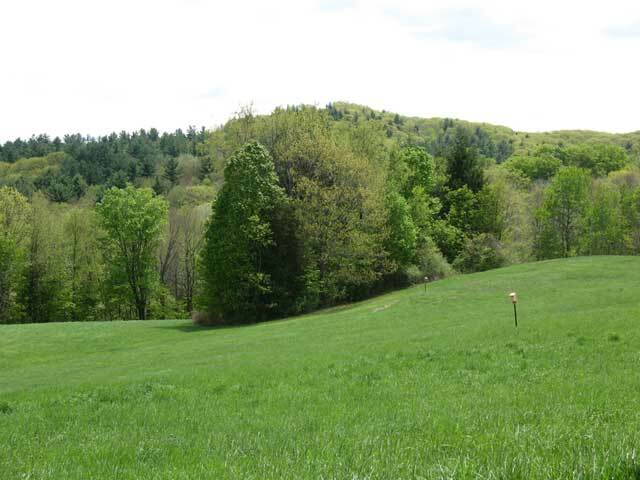 Now, the property consists of hayfields, horse pasture, and forest. 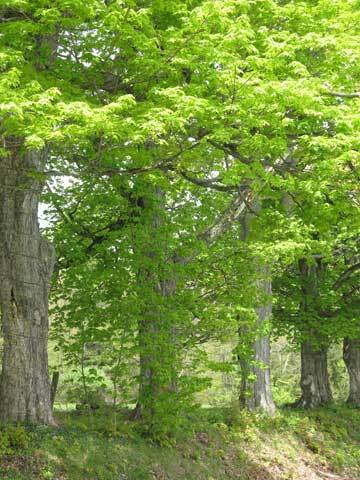 About 80% of the property is forested with a mixture of hardwoods and conifers. The open land is primarily along the road, giving it high development potential. The property is a recreational and wildlife habitat haven. There are streams and waterfalls, and a pond to swim in. The Bortons hike or ride their horses through the woods. They have observed deer, moose, black bear, otter, beaver, foxes, bluebirds and bobolinks. The property abuts the Poland Brook Wildlife Management Area (WMA), making it a key piece of land to preserve in order to maintain wildlife habitat core areas and connectivity. The Bortons enrolled their property in Chapter 61A (Agricultural Use Assessment) about thirty years ago. They produced enough farm income from livestock (raising Arabian and Quarter horses), hay, and firewood to qualify for the program. They primarily enrolled for the property tax savings, but this was also the first step in what ultimately became a decision to permanently protect their property. They have had a forest management plan for about 20 years. They don’t manage intensively for timber, but feel it is important to have a management plan so they can make ecologically sound management decisions. Most of their harvests have been for firewood. The Bortons also actively manage their land for wildlife. They participate in MassWildlife's Landowner Incentive Program (LIP), which helps private landowners by providing advice and paying for activities to improve wildlife habitat. 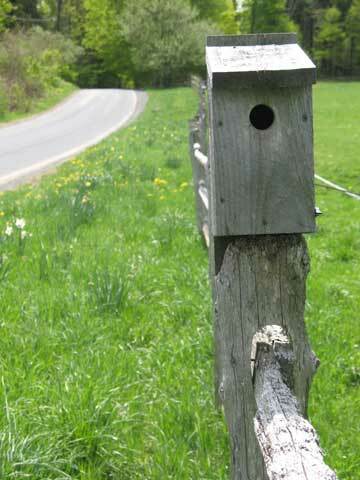 The Bortons primarily manage their land to benefit grassland-nesting birds. Under the LIP program, the Bortons delay harvesting their hay until after grassland birds have fledged their young. In addition, funding has allowed them to remove trees and hedges from within their fields to increase the effective size of the grasslands and to reduce predator refuges and to remove exotics such as multiflora rose. They have also received funds to create 5 one-half to one-third-acre meadow clearings in their forested areas to provide habitat and food resources for a variety of other species. Why put the land into permanent conservation? The Bortons decided to permanently protect their property because they know how dramatically the character and ecological integrity of an area can change with development. Ann and Tony have seen areas that were once rural become forever changed—areas that once seemed unlikely to become heavily populated. Central New Jersey, where they grew up, was once rural. Now—it is all gone—replaced, as Tony says, by “wall to wall houses.” They used to visit the New Jersey shore. Now, instead of dunes, there are houses. On their honeymoon, Ann and Tony visited what was then a largely rural Cape Cod. They have witnessed places lose their rural character and become heavily developed. They don’t want to see this happen to the hilltowns, but without protection they see it is both possible and inevitable. Ann and Tony’s fear of Conway losing its rural character isn’t unfounded. In 2007, the Franklin Regional Council of Governments and Town of Conway released a Master Plan, which includes future development scenarios. Under the maximum build-out scheme, given current zoning laws, road frontage, and topography, just 45 acres of Ann and Tony’s property could be divided up into 17 building lots. Ann and Tony’s children do not live in the area. While their children and grandchildren enjoy the property, the Bortons think it unlikely that they will choose to live on the property. Reducing the inheritance tax by placing a Conservation Restriction is one method to ensure that the property will not be a burden to the Borton's heirs and that they can keep the property should they choose. Alternately, if the property is sold, the CR upholds the Bortons’ wishes by ensuring that the land cannot be developed in the future. The Bortons first placed an Agricultural Preservation Restriction (APR) on a portion of their property (approximately 70 acres) in 2001. That agreement assured that the property would not be developed but would remain in agricultural use in perpetuity. Recently, they decided that an APR was not the most appropriate means of protecting their land for the long-term because their heirs or future owners may not choose to farm the land. They decided to convert the original APR to a Conservation Restriction (CR) and to enroll the remainder of their property. Under a CR, the land does not need to produce any marketable goods. In total, the 106 acres of their 114-acre property are now under a CR. They began the process of donating the CR to the Franklin Land Trust and the Town of Conway in 2006. In preparation to donate the development rights to their property, they consulted lawyer who specializes in Tax Law to help them determine the long-term ramifications of their decision. In addition, they discussed their plans with their children, who are supportive of their decision. The Franklin Land Trust prepared the paperwork and facilitated the process of placing the CR on the property. The deal required approval by the State of Massachusetts Department of Energy and Environmental Affairs (EOEEA), the Town of Conway Select Board, and the Town of Conway Conservation Commission. The entire process took approximately 18 months. The process is described in greater detail in the timeline. The Bortons worked closely with the Franklin Land Trust to develop the language of the CR. They retained certain rights, such as to keep horses, produce hay and harvest timber according to their management plan. Although they want to preserve the land from development, they do not want to make required maintenance on the property impossible. They made sure that they retained the right to maintain the pipe that delivers water from an upslope spring and to maintain or replace the septic tank that is located downslope of the home within the protected open field. The Bortons decided to exclude the area surrounding their home, as well as two potential building lots adjacent to the existing home. They did this to leave options for themselves or any future owners of the property. This enables them to construct a second home should the current home become unsuitable, to build a family vacation home, or to sell should they require cash for unexpected expenses. Two homes are better than 17. The value of a CR is the loss in value due to the inability to develop or fully utilize the land. To determine the value of the CR on the Borton's property, an appraiser “virtually” divided the 36-acre parcel into 12 large lots, rather than the 17 allowed by maximum build-out. He then determined the value of each of the lots if they were to be developed. They worked hard to finalize the CR donation by the end of 2007 so they could take advantage of special tax laws that were about to expire. Under the law, the value of a CR donated to a not-for-profit organization could be deducted from income over a 15-year period, greatly enhancing the tax benefit to the Bortons. In addition to the short-term income tax benefits, the value of the CR is effectively removed from the value of the property. Their estate taxes will be much lower, because the value of the property has been reduced. This will allow the Borton's heirs to keep the property rather than having to sell it to pay inheritance taxes. When selling or donating a CR, Land Trusts generally require an additional monetary donation from the landowner in order to set up an endowment for the property. Income from the endowment allows the Land Trust to conduct annual monitoring on the property. In the case of the Bortons, the Franklin Land Trust allowed them to donate in increments rather than in one lump sum. Why donate to both the Franklin Land Trust and the Town of Conway? Although they know the Franklin Land Trust will uphold the terms of the CR, Ann and Tony felt that it would be prudent to have a local presence involved in the long-term protection of their land. By including the Town of Conway’s Conservation Commission as a holder of the CR, they ensure that there are “local eyes” watching over the property to ensure that future landowners stay faithful to the terms of the restriction. They also felt that by including the Town of Conway, the residents of the town would feel a sense of ownership and pride in the project, and it would help foster a conservation ethic in town. Learn as much as you can about your conservation options and the process of donating a Conservation Restriction. Read books, go to meetings, and learn from other landowners. Donating a CR can be a positive and rewarding experience. Landowners should be actively involved in the entire process. Take an active role in crafting the language of the CR. Leave your options open. Reserve enough land for heirs to build on or sell if money is needed in the future. By being actively involved in the process of developing the CR language, the Bortons got what they wanted and are comfortable with the deal. Landowners like the Bortons are great to work with because they have a vision for their property and are good stewards of the land. Land cleared for subsistence farming. Property supports dairy farm, apple orchard, and vegetable farm. Ann and Tony Borton purchase the 114-acre parcel. They raise horses, grow hay, and harvest firewood. The Bortons enroll their property in Chapter 61A (Agricultural Use Assessment). The Bortons work with a licensed forester to develop a forest management plan. The Bortons first become interested in placing permanent restrictions on their land. They attend meetings put on by the Deerfield Land Trust where they learn about the benefits from Steven Small, a lawyer and author on the tax benefits of conservation. The Bortons donate an Agricultural Preservation Restriction (APR) on 70 acres of their land to the Franklin Land Trust. 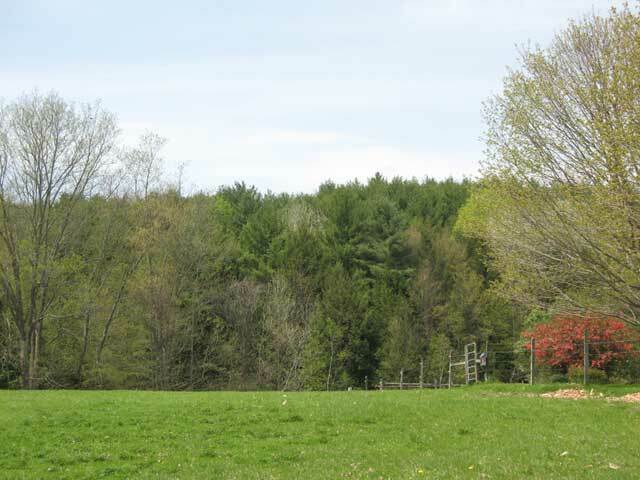 The Bortons begin the process of donating a Conservation Restriction on 106 acres of forest and open fields (70 acres converted from APR to CR plus 36 additional acres) to the Franklin Land Trust and the Town of Conway. The Bortons work closely with the Franklin Land Trust to determine acceptable uses and restrictions on the land, delineate excluded areas, and to develop the language of the Conservation Restriction. Franklin Land Trust submits the Draft CR proposal to Division of Conservation Services (DCS) at EOEEA. The State sends the Draft CR to their legal department for review. Residents of Town of Conway vote to allow the Town Conservation Commission to hold the Conservation Restriction in conjunction with the Franklin Land Trust. The Franklin Land Trust and the Bortons meet with the town Conservation Commission to get approval for the CR. DCS returns its comments on the Draft CR. The Franklin Land Trust and the Bortons revise the CR to address the State’s comments and concerns. The Franklin Land Trust and the Bortons meet with the Town of Conway Select Board to obtain their signatures on the CR. The Bortons and the Franklin Land Trust sign the CR. The Franklin Land Trust returns the final, signed copy of the CR to the State for the Secretary of Environmental Affairs to sign. The Bortons hire an appraiser to determine the value of the CR. Deal finished! The Conservation Restriction is formally recorded with the Franklin County Registry of Deeds. The Franklin Land Trust conducts a Baseline Documentation site visit to document the current condition of the property, including photographs and GPS points. 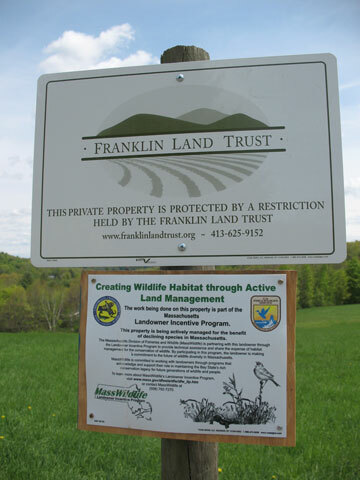 The Franklin Land Trust will continue to monitor the property once a year, in perpetuity. Members of the Town of Conway Conservation Commission will be invited to participate in annual monitoring.